← A Military History of Belarusian Lands Up to the End of Twelfth Century A.D.
One of the most interesting episodes in Byzantine military history and in medieval English history is the Anglo-Saxon participation and service in the Varangian Guards regiment from the late 11th to the early 13th century. In the 11th century, as a result of crises suffered by the Byzantine state (feudalization of the armed forces, civil-military conflict in the government, the loss of Asia Minor to the Seljuk Turks, the loss of Southern Italy to the Normans, etc.) the Byzantine army became increasingly dependent upon mercenary forces. Among the troops recruited into service of the Byzantine Emperor were Anglo-Saxons, who eventually made up the main component of the traditional foreign mercenary force that guarded the person of the Emperor. The crisis in Anglo-Saxon state and society brought on by the Norman Conquest created an Anglo-Saxon emigration, part of which found refuge and employment in Byzantium. Up until the Norman conquest of England, the Varangian guards consisted chiefly of Scandinavian and Kievan Rus’ warriors. Important work has been done on the development of the Varangian guard during its others. There are a number of problems that this paper will address. This paper will attempt to investigate the influx of English mercenaries into the Byzantine Army in the wake of the Norman Conquest of 1066. In particular it will study the changes in the elite Varangian Guards Regiment that came about by the entry of troops from England. Since the regiment up until that time consisted of Scandinavian and Kievan Rus’ troops, there is also a question as to whether there was a Norse and Russian connection to the Anglo-Saxon initiation into Byzantine service. The paper will also look into any evidence of ethnic or national consciousness among those English émigrés serving the Emperor in Constantinople from 1066 to 1204. This fascinating yet little known aspect of the transformation of Anglo-Saxon England in the wake of the Norman Conquest has been the subject of increasing scrutiny and investigation by scholars of Anglo-Saxon, medieval Scandinavian, and Byzantine history. While the knowledge of English serving in Byzantium has existed among modern scholars since the beginning of the systematic study of sources in the nineteenth century, the first significant study solely on the Anglo-Saxon military migration was made by A. A. Vasiliev in 1937. The great Russian émigré Byzantinist had earlier worked on the relations between Henry II Plantagenet and Manuel I Comnenus. He noted the mention of Englishmen serving in the Byzantine army in the correspondence of Manuel to Henry. 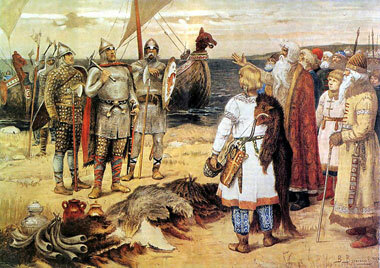 In his later study concentrating on English emigration to Byzantium, Vasiliev asserted that the warriors from England began arriving in Byzantium to serve in the Varangian guard well before 1066. He believed that Anglo-Danish huscarls entered service after leaving England upon the death of King Canute in 1035. Citing Orderic’s chronicle, Vasilievskii’s edition of Cecaumenus, and Byzantine chrysobuls, Vasiliev stated that English were serving widely in the Byzantine military by the 1070’s and 1080’s prior to the accession of Alexius Comnenus. This view was challenged by Franz Dölger in a review of Vasiliev’s article. He argued that the evidence, particularly the chrysobuls that exempted monasteries’ obligations toward imperial troops, which mention Inglinoi and Varangoi, is inconclusive over the question of the influx of English troops specifically within the Varangian Guard. Since that time scholars have debated when and to what extent did English enter service in the Guard. In the last fifteen years several articles, essays and two book-length studies have appeared which have dealt wholly or in part with the English in the Varangian Guard. Another issue that has been addressed in recent scholarship is whether the Anglo-Saxons dominated the Varangian guard from the late 11th century to the early 13th century. The paper will now review scholarship on those two problems and will also address the question of continuity and change in the Varangian guard in its Anglo-Saxon period. By continuity and change, I not only consider ethnic/regional composition, but also the organization, tactics, and duties of the Varangian Guard. The first Varangians in Byzantine Service, according to Benedikz and Blondal, were Christianized Russians (Rōs, for both Scandinavians and Slavs), who served with Dalmatians in the Great Company as marines in the time of Constantine Porphyrogenitus (ca. 930-950). Rōs served in naval expeditions against Crete in 902 and 949, and land campaigns in Syria in 955. It was no doubt this service that brought them into the Imperial guards. Under Basil II (976-1025), the troops from the land of Kievan Rus’ were organized into a separate unit that became known as the Varangian guard. Whether these initial troops were Scandinavian or Slavonic in ethnicity has been open to dispute, as part of the general “Normanist Controversy” in the historiography of early medieval Russia. Suffice it to say that the initial troops of the guard came from the lower terminus of the Great Eastern or Varangian route between the Baltic and the Black Sea, which became known as the Kievan Rus’ Principality. These troops were initially from Kievan Rus’ Lands, be they of Scandinavian or Slavonic origin. From the founding of the Varangian Guard to the last decade of the 11th century, the major component of the unit was Scandinavian. The troops initially were recruited from the lands of the Rus’ principalities and later came from further regions–Sweden, Norway, Iceland, Denmark and England. Sigfus Blondal and Benedict Benedikz have presented the most detailed account of this period of the Guard’s history and have offered varied evidence–Byzantine and Latin histories and chronicles, Scandinavian sagas, Slavonic saints’ lives, and runic inscriptions–to show the importance of the Scandinavian element in the guard. Sigfus Blondal (1874-1950), in an article in English and a posthumous book in Icelandic, argued that the Scandinavian element in the guard remained predominant up to the thirteenth century. However, in an English edition translated, expanded and revised by Benedict Benedikz, the case of extensive English service in the guard from the late 11th century is accepted. This generally-accepted conclusion came about as the result of extensive research and painstaking analysis of a variety of sources by a number of scholars since the 1940’s and especially in the last 15 years. They have studied and argued over the meaning of Byzantine sources such as the chrysobuls mentioned above, the Strategikon of Cecaumenus, the Alexiad of Anna Comnena; Latin sources, such as the Historia ecclesiatica of Ordericus Vitalis and the Chronicon universale anonymi Laudunensis; and Scandinavian sources, such as the Jatvardar saga and the Heimskringla. While legendary and conflicting accounts have led to differences of opinions among scholars, nonetheless corroboration of disparate sources have led virtually all scholars to agree on one point. A sizable contingent of Anglo-Saxons and Danes, who were not reconciled to Norman Rule in England, immigrated to Byzantium in the 1070’s. Their emigration was by sea through the Mediterranean. Some of the refugees did not accept imperial service and were allowed to settle in some area along the Black Sea coast. Others took on imperial service and became an important component in the Varangian Guard. Others fled into voluntary exile so that they might either find in banishment freedom from the power of the Normans or secure foreign help and come back to fight a war of vengeance. Some of them who were still in the flower of youth traveled into remote lands and bravely offered their arms to Alexius, emperor of Constantinople, a man of great wisdom and nobility. Robert Guiscard, the duke of Apulia, had taken up arms against him in support of Michael, whom the Greeks, resenting the power of the senate, had driven from the imperial throne. Consequently the English exiles were warmly welcomed by the Greeks and were sent into battle against the Norman forces, which were too powerful for the Greeks alone…This is the reason for the English exodus to Ionia; the emigrants and their heir faithfully served the holy empire, and are still honored among the Greeks by Emperor, nobility and people alike. A number of modern scholars believe that among the first military operations in which the Anglo-Saxons of the Varangian guard were involved was the Byzantine campaign in the Balkans against the Italo-Norman forces of Robert Guiscard. The Alexiad of Anna Comnena mentions their participation and elsewhere reports that these troops came from “Thule”. While this evidence has been open to dispute, revenge against the Normans may have been a factor in Anglo-Saxon service. They stayed a while in Micklegarth [Constantinople], and set the realm of the Greek-king free from strife. King Kirjalax [Alexius] offered them to abide there and guard his body as was wont of the Varangians who went into his pay, but it seemed to earl Sigurd and the other chiefs that it was too small a career to grow old there in that fashion, that they had not a realm to rule over; and they begged the king to give them some towns or cities which they might own and their heirs after them…king Kirjalax told them that he knew of a land lying north in the sea, which had lain of old under the emperor of Micklegarth, but in later days the heathen had won it and abode in it. And when the Englishmen heard that, they took a title from king Kirjalax that the land should be their own and their heirs after them if they could get it won under them from the heathen men free from tax and toll. The king granted them this. After that the Englishmen fared away out of Micklegarth and north into the sea, but some chiefs stayed behind in Micklegarth, and went into service there. Earl Sigurd and his men came to this land and had many battles there and got the land won, but drove away all the folk that abode there before. After that they took that land into possession and gave it a name, and called it England. To the towns that were in the land and to those which they built they gave the names of the towns of England. They called them both London and York, and by the names of other great towns in England…This land lies six days’ and six nights’ sail across the sea to the east and northeast of Micklegarth; and there is the best land there; and that folk has abode there ever since. According to the recently discovered Chronicon universale anonymi Laudunensis, a group of English notables immigrated to Byzantium in 235 ships, reaching Constantinople in 1075. Some 4350 of the emigrants and their families remained in Constantinople in imperial service, while a majority of the refugees sailed to a place called Domapia, six days’ journey from Byzantium, conquered it and renamed it Nova Anglia (New England). This account of these two sources has caught the attention of a number of scholars who have speculated as to the probability of such an Anglo-Saxon settlement, its location, and its possible role as an outpost of Latin Christendom. While there are fanciful and contradictory elements in the accounts of this emigration, most scholars agree that they are based on a real event or series of events. What are most interesting in these accounts are elements of ethnic identity, which are also evidenced in other sources that deal with the English in the Varangian guard. While the first king from the Normans, William, was reigning over England, an honorable man, educated in the chapter of the Blessed Augustine, along with many other noble exiles from the fatherland (patrie profugis), migrated to Constantinople; he obtained such favor with the emperor and empress as well as with other powerful men as to receive command over prominent troops and over a great number of companions; no newcomer for very many years had obtained such an honor. He married a noble and wealthy woman, and remembering the gifts of God, built, close to his own home, a basilica in honor of the Blessed Nicholas and Saint Augustine. Although questions have arisen as to the existence of this church, some scholars have identified it with a ruined chapel of Bogdan Sarai in Istanbul. Another example of the English identity in Byzantium is an account of a pilgrim-monk Joseph, who, while in Constantinople, “found a number of men there who came from his own fatherland (patria) and were from the imperial household (family).” These men, probably Varangian guardsmen, were able to get Joseph permission to view the imperial treasury of relics, of which he reputedly lifted a piece of a relic of Saint Andrew. The English for their part no longer had a homeland. They seem to have transplanted elements of the society they had known to Constantinople, such as their class structure, and their religion…The English Varangians seem to have preserved a distinctive identity well into the twelfth century if not later. While most scholars have discussed the problem of the composition of the Varangian Guard from the point of view of ethnic and regional changes, there are other factors such as organization and tactics that have received less attention. It is important to note not only the discontinuity in the ethic/regional changes in the guard from Kievan Rus’ to Scandinavian to English and Danish, but it is necessary to reiterate some elements of continuity in the guard. These elements are found in the guard’s basic purpose, organization and tactics. As to the purpose of the guard, the Varangians served as the personal life guard of the emperor and swore an oath of loyalty to him. They had formal duties within the imperial ritual, both as ceremonial retainers and acclaimers of the Emperor. They had police duties as personal guards of the emperor similar to a secret service; they could defend against plots and punish conspirators. They were avengers and/or executioners of persons threatening sedition, rebellion or treason against imperial authority. They also had extensive military duties, either when the emperor was on campaign, or on detached service with imperial armies. Much information on the subject of English in Byzantine military service has become more established and detailed with the efforts of recent scholarship, but the conflicting and disparate nature of the sources, together with their scarcity, have left a number of questions unanswered. While all scholars agree there was a significant influx of Anglo-Saxons into the Byzantine army, and especially the Varangian Guard, in the late eleventh century. They have not yet clearly established if Scandinavian, Russian, or Byzantine links may have influenced this entry, either through earlier mercenary service or through other avenues. They have also not explained how the English character of the guard continued for over a century. Was the English identity of the guard passed on to generations born into the service in Byzantium, or were there subsequent recruitments of English into the Varangians. Some scholars have indicated that there may have been later English influxes into the guards, but the evidence is not conclusive. It is hoped that these and other questions will challenge Anglo/Byzantine scholars in the years to come. and their source of manpower,” in War, Technology, and Society in the Middles East, V. J. Parry and M. E. Yapp, eds. (London: Oxford University Press, 1975), pp. 125-152; and Speros Vryonis, The Decline of Medieval Hellenism in Asia Minor and the Process of Islamization from the Eleventh through the Fifteenth Century (Berkeley: University of California Press, 1972), pp. 86-142. This interest is not limited to scholars, In the 1990’s group of medieval re-enactors in Australia organized an association known as the New Varangian Guard, which works toward recreating elements of Varangian history. It publishes a quarterly journal entitled Varangian Voice, which includes historical information, as well as news regarding the activities of the association and practical information on reproducing armor, costume and weaponry. See their web site at: http://www.geocities.com/svenskildbiter/NVGInc/. See for example: E. Freeman, The History of the Norman Conquest (Oxford, 1971), pp. 627-633; the commentary of Jacob Gretser and Jacob Goar of Geōrgios Kōdinos, Peri tōn offikialiōn tou palatiou tou Kōnstantinoupoleōs (De officiis), in J. P. Migne, ed., Patrologiae Cursus Completus, vol. 157 (Paris, 1854), pp. 294-295; and G. Vasilievskii, “Variago-russkaia i variaggo-angliiskaia druzhina,” in Trudy, I (St. Petersburgh, 1908), pp. 355-378. A. A. Vasiliev, “Manuel Comnenus and Henry Plantagenet,” Byzantinsches Zeitschrifte 29 (1929-30): 239-240. A. A. Vasiliev, “The Opening Stages of the Anglo Saxon Immigration to Byzantium in the Eleventh Century,” Seminarium Kondakovianum 9 (1937): 45. Earlier, another Russian scholar, V. G. Vasilievskii, “Variago-russkaia i variaggo-angliiskaia druzhina,” pp. 356-358, questioned the early influx of Anglo-Saxons, but Vasilievskii also believed that the ethnic composition of the Varangian Guard remained Scandinavian and Slavonic from the lands of the Kievan Rus’ throughout the 11th century (pp. 347-350). A. A. Vasiliev, “The Opening Stages of the Anglo Saxon Immigration to Byzantium in the Eleventh Century,” pp. 53-59. Franz Dölger, “Review of [A. A. Vasiliev, “The Opening Stages of the Anglo Saxon Immigration to Byzantium in the Eleventh Century,” Seminarium Kondakovianum 9 (1937): 39-70],Byzantinsches Zeitschrifte 38 (1938): 235-236. The most cogent analysis of the problem of the chrysobuls is found in Jonathan Shepard, ” The English and Byzantium: A Study of Their Role in the Byzantine Army in the Later Eleventh Century,” Traditio 29 (1973): 53-92. These include: Benedikt S. Benedikz, “The Origin and Development of the Varangian Regiment in the Byzantine Army,” Byzantinsches Zeitschrifte 62 (1969): 23-24; Sigfus Blöndal, The Varangians of Byzantium, Benedikt S. Benedikz, tr., rev. and ed. (Cambridge: Cambridge University Press, 1978); Krijnie Ciggaar, “England and Byzantium on the Eve of the Norman Conquest,”Anglo-Norman Studies. Proceedings of the Fifth Battle Abbey Conference 5(1981): 78-96; Krijnie Ciggaar, “L’emigration anglaise a Byzance apres 1066,” Revue des etudes Byzantines 32 (1974): 301-342; Krijnie Ciggaar, Byzance et l’Angleterre (Doctoral Dissertation: Leiden, 1976); Christine Fell, ” The Icelandic Saga of Edward the Confessor: Its Version of the Anglo-Saxon Emigration to Byzantium,” Anglo-Saxon England 3 (1974): 179-196; John Godfrey, “The Defeated Anglo-Saxons Take Service with the Eastern Emperor,” Anglo-Norman Studies. Proceedings of the First Battle Abbey Conference 1 (1978): 63-74, 207-209; Constance Head, “Alexios Comnenos and the English,” Byzantion 47 (1977): 186-198; Donald M. Nicol, “Byzantium and England,” Balkan Studies 15 (1974): 179-203; Leslie Rogers, “Anglo-Saxons and Icelanders at Byzantium: With Special Reference to the Icelandic Saga of St. Edward the Confessor,” in Australian Association for Byzantine Studies. Byzantina Australiensia 1. Byzantine Papers. Proceedings of the First Australian Byzantine Studies Conference. Canberra, 17-19 May 1978. E. Jeffreys, M. Jeffreys, and A Moffatt, eds. (Canberra: Australian National University, 1978), pp. 82-89; Jonathan Shepard, “Another New England? –Anglo-Saxon Settlement on the Black Sea, Byzantine Studies 1:1 (1974): 18-39; Jonathan Shepard, ” The English and Byzantium: A Study of Their Role in the Byzantine Army in the Later Eleventh Century,” Traditio 29 (1973): 53-92. Under Augustus, a private guard of Germans, known as the Collegium Custodum Corporis or Germani Corporis Custodes, was formed to offset the native Roman Praetorians. Although they were suppressed later in his reign, the German guard was reformed by Tiberius and served through the reign of Nero. Later, particularly from the 3rd century on, Germans and other foreigners served in such imperial guard units as the scholae palatinae as well widely throughout the army. Michael Grant, The Army of the Caesars (New York, 1974), pp. 87, 91, 105, 119, 146-149, 163, 171, 180, 182, 231, 252, 263, 272, 277, 280; and Peter Wilcox, Rome’s Enemies: Germanics and Dacians (London: Osprey, 1982), pp. 27-32. On the foreigners in the Roman Army, see A.H. M. Jones,The Later Roman Empire, 284-602 (University of Oklahoma Press. 1964), pp. 663-668. Mauricius, Maurice’s Strategikon: Handbook of Byzantine Military Strategy, George T. Dennis, ed. and tr. (University of Pennsylvania Press, 1984), pp. vii-ix, 12, 28-30, 41-44; Gretser and Goar commentary of Geōrgios Kōdinos, Peri tōn offikialiōn toy palatiou tou Kōnstantinoupoleōs (De officiis), pp. 209; Sigfus Blöndal, The Varangians of Byzantium, Benedikt S. Benedikz, tr., rev. and ed. (Cambridge: Cambridge University Press, 1978) [henceforth, Blöndal and Benedikz, Varangians ], p. 21; and Ian Heath, Byzantine Armies 886-1118 (London: Osprey Publishing, 1979), pp. 13-14. Blöndal and Benedikz, Varangians , p.21; Heath, pp. 13-14. Blöndal and Benedikz, Varangians , p.26; Heath, pp. 14. Benedikt S. Benedikz, “The Origin and Development of the Varangian Regiment in the Byzantine Army,” Byzantinsches Zeitschrifte 62 (1969): 23-24; and Blöndal and Benedikz,Varangians , p.21. Blöndal and Benedikz, Varangians , p.27, 30, 37-38. Benedikz, pp. 23-24; and Blöndal and Benedikz, Varangians , pp. 41-45. For varying views, see Blöndal and Benedikz, Varangians , pp. 80-83, 89, 116-117, 123; and G. Vasilievskii, “Variago-russkaia i variaggo-angliiskaia druzhina,” pp. 345-350. Benedikt S. Benedikz, “The Origin and Development of the Varangian Regiment in the Byzantine Army,” pp. 24-30; Blöndal and Benedikz, Varangians , pp. 55-121. Blöndal and Benedikz, Varangians , pp. 33-121. Sigfus Blöndal, “Moabites the Varangian,” Classical et Medieval 2 (1939): 145-167; and Blöndal, Væringjsaga (Reykjavik, 1954). Blöndal and Benedikz, Varangians , pp. 141-147. The first source discovered that mentioned this particular emigration is a 14th-century Icelandic life of Edward the Confessor entitled the Jarvardar saga. Study and discussion of this source and emigration began with a passing note in Blöndal, “Nabites the Varangian,” p. 147 and a discussion of the Jarvardar saga‘s relation to Orderic Vitalis’s account by R. M. Dawkins, “The Later History of the Varangian Guard: Some Notes,” The Journal of Roman Studies 37 (1947):41-42. Blöndal again discussed the emigration mentioned in the Jarvardar saga and concluded that it was full of ambiguities (Blöndal, Væringjasaga, p. 218, as quoted in Christine Fell, ” The Icelandic Saga of Edward the Confessor: Its Version of the Anglo-Saxon Emigration to Byzantium,” Anglo-Saxon England 3 (1974): 179, n. 5). Later work by Christine Fell (” The Icelandic Saga of Edward the Confessor: Its Version of the Anglo-Saxon Emigration to Byzantium,” pp. 179-186), Krijnie Ciggaar (“L’emigration anglaise a Byzance apres 1066,” Revue des etudes Byzantines 32 [l974]: 301-342); and Jonathan Shepard (” The English and Byzantium: A Study of Their Role in the Byzantine Army in the Later Eleventh Century,” Traditio 29 : 53-92) have affirmed that the emigration and recruitment occurred. Ciggaar’s discovery of a corroborating Latin source (Chronicon universale anonymi Laudunensis) and Shepard’s comprehensive study of all available sources have gone far to substantiate and clarify conflicting traditions. The Ecclesiastical History of Ordericus Vitalis, M. Chibnall, ed. and tr., vol. 2 (Oxford University Press, 1969), pp. 202-205. Anna Comnena, The Alexiad, E. R. A. Sewter, tr. (Baltimore: Penguin Books, 1969), pp. 95-96, 100-101, 124, 144, 206, 224, 392, 447. Blöndal, “Nabites the Varangian,” Classica et Mediavalia 2 (1939): 145-167; Blöndal and Benedikz, Varangians , pp. 126-127, 141-142; Jonathan Shepard, ” The English and Byzantium: A Study of Their Role in the Byzantine Army in the Later Eleventh Century,” Traditio 29 (1973): 72-76. The Saga of Edward the Confessor, , in The Orkneyingers’ Saga, G. W. Dasent, tr. vol. 3, Roll Series (London, 1894), pp. 427-428; also in Krijnie Ciggaar, “L’emigration anglaise a Byzance apres 1066,” Revue des etudes Byzantines 32 (1974): 340-342. Ciggaar, “L’emigration anglaise a Byzance apres 1066,” p. 323, 337-338. Miracula Sancti Augustini Episcopi Cantuariensis, in Acta Sanctorum, May, VI, p. 406; translated in Vasiliev, “The Opening Stages of the Anglo Saxon Immigration to Byzantium in the Eleventh Century,” pp. 60-61. R. Janin, “La siege de Constantinople et la Patriarchat oecumenicque: les eglises et les monasteres,” in La geographie ecclesiastique de l’Empire byzantin, vol. 3 (Paris, 1953), p. 579, 591. Charles H. Haskins, “A Canterbury Monk at Constantinople,” English Historical Review 25 (1910): 293-295. Shepard, “The English and Byzantium,” p. 90. Peri tōn offikialiōn tou palatiou tou Kōnstantinoupoleōs (De officiis), in J. P. Migne, ed., Patrologiae Cursus Completus, vol. 157 (Paris, 1854), p.76. Nikētas Chōniatēs, Historia Nikēta Chōniatē), ed. I. Bekker (Bonn, 1835, p. 547; and the commentary of Jacob Gretser and Jacob Goar of Geōrgios Kōdinos, Peri tōn offikialiōn toy palatiou tou Kōnstantinoupoleōs (De officiis), in J. P. Migne, ed., Patrologiae Cursus Completus, vol. 157 (Paris, 1854), pp. 294-295. For a discussion of the Danes in the guard, see Blöndal and Benedikz, Varangians, pp. 130-141, 147-166, passim. Warren Hollister, Anglo-Saxon Military Institutions (Oxford University Press, 1962), pp. 134-140; Nicholas Hooper, “Anglo-Saxon Warfare on the Eve of the Conquest: A Brief Survey,”Anglo-Norman Studies. Proceedings of the Battle Abbey Conference I (1978): 85-87. On the druzhina of the Kievan Rus, see: M. A. Diakonov, Ocerki obchestvennago i gosudarstvennago stroia drevnii Rusi, ed. 4 (St. Petersburgh, 1912), pp. 74-80; I. A Malinovskii, “Drevniaia russkaia aristokratiia,” Sbornik statei po istorii prava posviavennyi M. F. Vladimirskomu-Budanovu (Kiev, 1904), pp. 256-274; B. I. Sergejevich, Drevnosti Russkago pravda, vol. 1 (St. Petersburgh, 1908), pp. 364-373; George Vernadsky, Kievan Russia (New Haven: Yale University Press, 1947), pp. 138-139, 174, 177, 334-335; and G. Vernadsky, Medieval Russian Laws (New York: Columbia University Press, 1947), pp. 27-28; M. F. Vladimirskij-Budanov, Obzor istorii Russkago prava, ed. 7 (St. Petersburgh, 1908), pp. 25-31. On the Vikinge-lags, Danlags andJomvikings, see: Blöndal and Benedikz, Varangians , pp. 201-202; and Ian Heath, The Vikings (London: Osprey, 1985), p. 45. On the Huscarls, see Warren Hollister, Anglo-Saxon Military Institutions (Oxford University Press, 1962), pp. 134-140; Nicholas Hooper, “Anglo-Saxon Warfare on the Eve of the Conquest: A Brief Survey,” Anglo-Norman Studies. Proceedings of the Battle Abbey Conference I (1978): 85-87: L. M. Lareson, The King’s Household in England before the Norman Conquest (Madison, WI: University of Wisconsin Press, 1904), pp. 157-159. Blöndal and Benedikz, Varangians , pp. 182-185. Virtually all Byzantine sources claim that the basic weapon of the guardsmen was the large battle-axe, under the names peleki (axe), rōmphaia (falx), seiromastēn, riptarion, saliba, and tzēkourion (securis, hatchet). There is some question as to whether there was a traditional Byzantine ceremonial halberd-like weapon that was carried in imperial ritual. Mention of the extensive use of the axe in battle nonetheless links the Varangian axe to that used use by huscarls and other mercenary troops. See: Blöndal and Benedikz, Varangians , pp. 183-184; the commentary of Jacob Gretser and Jacob Goar of Geōrgios Kōdinos, Peri tōn offikialiōn toy palatiou tou Kōnstantinoupoleōs (De officiis), in J. P. Migne, ed., Patrologiae Cursus Completus, vol. 157 (Paris, 1854), pp. 269-270, 294-295; Ian Heath, Byzantine Armies, 886-1118 (London: Osprey, 1979), p. 10, 17; Ian Heath, The Vikings (London: Osprey, 1985), p. 51; David Nicolle, Arthur and the Anglo-Saxon Wars(London: Osprey, 1984), pp. 25-31; A. V. B. Norman and Don Pottinger., English Weapons and Warfare 119-1660 (New York Dorset, 1985), pp. 20-24; George Cameron Stone, A Glossary of the Construction, Decoration and Use of Arms and Armor in All Countries and All Times (New York: Brussels, 1961), passim; Terence Wise, Saxon, Viking and Norman (London: Osprey, 1979), pp. 13, 25-26. The best account of Hardrada’s Byzantine career is found in Blöndal and Benedikz, Varangians , pp. 54-110. Vernadsky, Kievan Russia, pp. 336-337. Krijnie Ciggaar, “England and Byzantium on the Eve of the Norman Conquest,” Anglo-Norman Studies 5(1981): 78-96. Donald Nicol, “Byzantium and England,” Balkan Studies 15 (1974): 191-193; Shepard, “The English and Byzantium,” p. 78-80. This entry was posted in Articles and tagged 11C, 12C, Anglo-Norman, Anglo-Saxon, Asia, Byzantine, Constantinople, early medieval, England, Kievan Rus, Norman Conquest of England, Norman Conquest of Southern Italy, Norse, Rus, Scandinavia, Seljuk Turks, social history, Varangians. Bookmark the permalink.